As consolidation of health systems sweep through the healthcare industry, standardizing operations and creating a unified mindset can become a challenge. In a live special webinar event, Ambra Health CMO, Mini Peiris, was joined by Miriam Sznycer-Taub of the Advisory Board who shared how the key to enterprise “systemness” can and should start within imaging departments. The audience learned how unlocking imaging’s strategic advantage offers high quality care at a low cost. Poll Question 1 – What is the major imaging technology goal for your practice or facility this year? Before Mini and Miriam jumped into their discussion, the audience was asked what a major IT goal was for their facility this year. 60% of audience members cited getting all imaging into one comprehensive archive as their goal. An additional 40% of attendees were split between keeping up with patient demands for access, like patient portals, and linking report and imaging to provide a more holistic view. 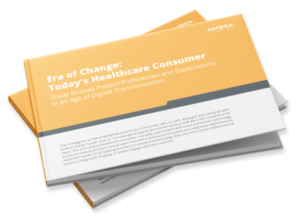 Mini shared that these were trends they had witnessed across Ambra Health’s customers as well. As facilities accommodate ever increasing image volumes, systems, users, and organizations, the elastic architecture of the cloud allows them the capability to do so without the need to worry about provisioning more infrastructure and resources. And, as newer technologies like Artificial Intelligence and Machine Learning become realities, having readily available and complete imaging data is critical. Imaging must become a strategic asset. Poll Question 2 – Do you think the number of multi-hospital health systems has grown? Although the numbers show a clear growth in the number of multi-hospital health systems, we wanted to hear if providers felt this was their experience. Over 77% agreed that not only the number of systems had grown, but also the amount of medical data, including imaging, had grown right with them. The Advisory Board has found that 94% of their imaging performance partnership members are part of a multi-hospital system. Reasons for this consolidation often include, higher quality care through a greater network of physicians, reduced duplication of imaging and procedures, and lower costs. However, consolidation doesn’t always equal integration with a frequent lack of unified vision, organized metrics, and ill-defined system governance. Poll Question 3 – If you have experienced health system growth, what has the greatest challenge been? While over half of attendees cited siloed data management systems as their greatest challenge, the rest of the audience was divided among management challenges, lack of unified vision, and a lack of quality metrics and data to strategize. Miriam dove into “systemness” as a solution, Simply put, systemness is a system that functions as one solid body, and imaging is a great place to start. The five keys to imaging success include defining system wide governance, engaging in system-wide planning, investing in a modern imaging IT enterprise solution, establishing consistent staff expectations, and achieving financial integration. IT solutions that provide enterprise wide systemness should include items like an enterprise-wide viewing system, a single point of storage for imaging, and easy access for patients. The cloud provides a much more flexible solution than traditional siloed department hardware. Are you part of a large health system? Is imaging trapped in silos across it? We’d love to hear your experience – share it below!